In the transition process from a centrally planned to a market economy the financial sector has a vitally important role to play. Nevertheless, transformation research has largely neglected rural finance and its link to the development of agriculture and the rural economy. This book intends to fill this gap. It addresses such questions as 'how and in what sequence can rural finance be restructured', 'how can it support rural enterprise efficiency and help break the cycle of enterprise inefficiency, illiquidity and over-indebtedness', 'how can the typical constraints of uncertain land-ownership for financial institutions in the transformation process be overcome', and 'what type of institutional innovations are called for'. These issues are evaluated in the light of theory and empirically analysed for the country case Romania. The book consists of three parts. First, it discusses rural finance and transition from a theoretical perspective. 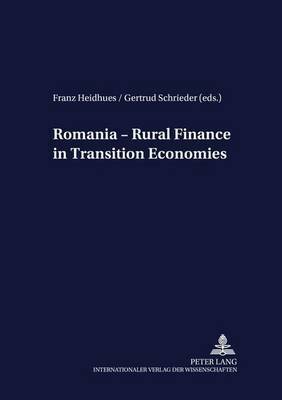 The second part contains empirical research results relevant to the development of Romania's rural sector. Thirdly, it formulates policy recommendations to overcome market and government failures in building an efficient rural financial market in transition countries.